Compiled By: Barry Barton Shiloff 1937-_______ and Joyce Marie Wheeler Shiloff 1937-_______ This is a work in progress. Revised 23/Mar/02. Current work in 2016 to maintain the genealogy and to create coherent web content. We encourage anyone who may possibly have information pertaining to the older generations to please provide it to us. We would especially like documents, if any exist, from the old country which contain family names or perhaps a letter exists. When reading the following pages of this presentation please note: Spelling of the same name may vary as we have seen documents with variations and do not know which should be used. In some cases we have never seen any official documents therefore we chose a spelling. This information was gathered by Barry Shiloff and spouse Joyce Shiloff (nee Wheeler). Our approach was to start with the living and ask for family information such as names, dates etc. There has been a lot of help, but, special thanks goes to the following: Jesse Levine (Shiloff), Delia Fleischman (Shiloff), Rose Fisher (Shiloff), Marion Slutsky (Shiloff) who provided a start by supplying their family information. On the Barnett Shiloff and the Anna Shiloff Heshelow branch, Freda Goldenberg Shiloff provided a huge amount of information. Also Elyzabeth H. Hemphill was doing genealogical work on the Shiloff / Heshelow side and generously shared that work for this endeavor. An awareness of time and sense of place are two essential aspects of the human condition. They help us understand who we are and how we came to be that way. Knowing ones family heritage is certainly a part of this. Sometimes we may wish we could choose our family as we do friends -- still -- we may do no better. It is our hope that one or more members of the immediate and extended family will, if not continue the record keeping, will maintain what we have started until a new family member catches the historian bug. It may look like a lot of work to some and a quirky hobby, but we find it quite exciting. We have learned a lot about our country's history as well as the family history. Vacations take us to various places looking for documents so we see parts of our country we would normally ignore and it has always been very enjoyable. Here is an example. Most people do not know that many of the people coming here on the Mayflower started on their journey from a town in England named Scrooby. We know it because we went there and found the people of the town are very much aware of this fact and have preserved parts of this tiny town for posterity. We went to England searching - you see Joyce traces her family to the Mayflower and beyond; one of Joyce's Mayflower family, (William Brewster's father and later William Brewster himself) was sort of an administrator of Scrooby Manor, a palace of the Archbishop of York. That is the type information we think interesting and is a part of our history passed to our progeny. We hope to gather enough of these facts on any member of the "greater family" to enter into this book to make it interesting. This book information starts in Russia and a good point is made in a dictionary of Jewish Surnames, from the Russian Empire by Alexander Beider (pub. Avotaynu PO Box 1138 Teaneck , NJ 07666). Beider points out; if one wishes to trace the families in Russia look in the "Pale of Settlement." In 1772 and 1793, portions of Poland were ceded to Prussia, Austria and Russia. In 1795 the final partition of Poland ceded the balance of Poland to these three countries, and Poland ceased to exist as an independent country until 1918. In the part ceded to Russia, Jews were permitted to live only in the area just acquired. This area became known as the Pale of Settlement. At the time the author is writing this, it is not anticipated that much more will be done to trace the genealogy any further in Russia; if at a future time anyone takes on that task, keep the above issue in mind. Aside from our own pleasure gathering the data for this book, if delineating the known family members at this time helps in some small way to preserve any form of cohesiveness or any pleasure for others to simply know about the greater family, we will be pleased. Immigrants coming to America must have had a lot of courage, and many apprehensions. They would be fearful of being turned away, they would not know the laws in the new country, they would not know the language, they would not have friends, maybe they would be lucky - a member of the family was already here and was waiting for them. Barnett paved the way as he was the first to come here, however, his destination was paved by another who came prior to him - a cousin in NY. 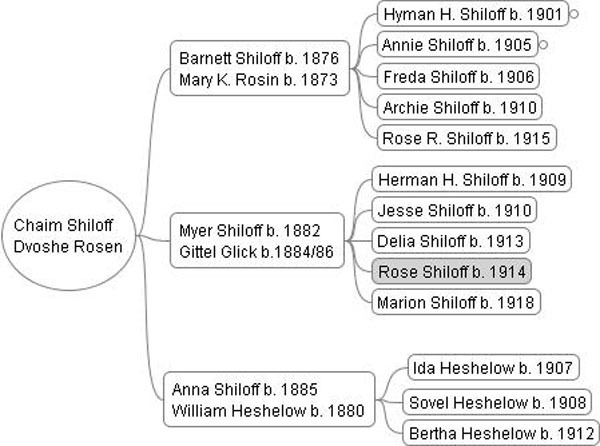 I have found information for three Shiloff immigrants, my grandfather Myer, his brother Barnett and sister Anna. Following is some information from ships' manifests which are very helpful in constructing their genealogy. Unfortunately many documents were written in longhand, not spared from the ravages of time, and the style (or look) of some letters is not easily recognizable without a good deal of studying samples from the time period. For Gittel, I copied and pasted the town name of her last residence from the manifest - It turns out this is Swankowirzy. This is in the area of Lithuania. In the table below, I am showing information on each person gleaned from a ship manifest. These documents are in archives that are available to anyone. Usually one searches for an individual by name. The data bank of names is compiled by someone who looked at the original document and entered what they thought they saw, however, they did not realize what they saw was not what was meant. The names I show "listed on the ship manifest" is how they were listed. Barnett Shiloff arrived in New York on 25 Nov. 1902. Traveling on the same ship was Riwe Zadow with two children; Schmiel and Chasche. The notation in the manifest shows the destination as Bere Zadow at 313 Madison Street NY. Shown as the husband of Riwe and cousin of Barnett. I have been unable to obtain any information on Zadow. Barnett's arrival paved the way for the rest of those shown in the chart. It is a lucky break the destination shown for all of them is to Barnett's address. What wonderful evidence confirming that we found the person for whom we were looking. Unfortunately the documents were written in longhand, not spared by the ravages of time, and the style (or look) of some letters is not easily recognizable without a good deal of study and therefore, very hard to read. For those who like puzzles, you will understand when I say what it is a real thrill to find documents such as a ships manifest that contains the sought after information. It can, however, be rather difficult locating a person when the name on the document differs far from the expected e.g. Berke Schilow rather than Barnett Shiloff. Also there are errors to confuse one. As an example on Myer Shiloff's Petition for Naturalization it shows the Kroonland as the ship on which he came to the USA when in fact it was the Zeeland. I searched the records of the Kroonland for years before solving this little riddle. This genealogy will start with the male and female lines traced forward from Shiloff and Glick. It is presented in segments (family lines) within one domain. A good starting point would be the link to Chaim, then onto one of his three children. * Of note, is information on the legendary shipping company Red Star Line. They brought our family, and two million other passengers over time, in search of the American Dream Red Star Line Museum in Belgium, and a great video of how our families got here. Chaim (Hyman) SHILOFF was born in Russia. He married Dvoshe ROSIN She was born in Russia. Her middle name may have been Reiza. 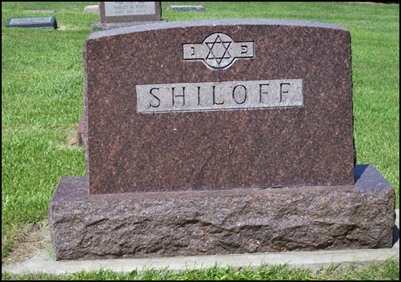 Research on the name Shiloff: I have not seen any family document that has the name Shiloff written in the Cyrillic alphabet and am not sure if the transliteration is correct. I suspect the name may have been Shilov, but that is only a suspicion. I found the following: A Dictionary of Jewish Surnames from the Russian Empire by Alexander Beider, pub. Avotaynu PO Box 1138 Teaneck NJ 07666. Beider lists names by transliteration of Russian. The name Shilov: Derived from: the village of Shilovo or Shklov. Found in provinces or districts Orsha, Vitebsk, Sebezh, Polotsk, Lyutsin. Zhilov: (Lyutsin, Vitebsk) Zhilin: from Zhily (Belorussian) Meaning Force, Strength. Shilo: Novograd, an occupational name meaning awl. Keeping in mind; Barnett, Myer and Anna were immigrants who spoke with an accent and probably did not like to confront authority it is no wonder their name and the names of their parents are listed somewhat differently, especially if they orally gave the information each time any form is filed out. I would also guess that when they were asked their parents name they may have responded one time with an American version of the name and at another time give an old world version. Found this information on the cemeteries in Sioux City, Iowa in an article. "The Orthodox established the Independent Farane out on Lakeport. The Conservatives had Mount Carmel, which was part of Floyd Cemetery. And the Reform Jews had their own section of Floyd Cemetery, which was called Mount Sinai."